Mike Moore | The Journal Gazette Carroll's Ashelynn Steinke competes in the floor exercise Saturday in the Concordia Gymnastics Sectional. With Bishop Dwenger missing standout Elaine Cornewell, Carroll snapped the Saints’ 10-year sectional championship streak Saturday. The Chargers scored 111.775 points, besting Dwenger’s 110.65. Homestead snared third place with a 107.875 to pick up the last team qualification spot for regionals. Carroll turned in half of the top 6 all-around performances on the day. McKinley Carroll scored a 37.4, good for second, while Ashelynn Steinke and Jillian Hoffmann placed fifth and sixth, respectively. Dwenger’s Sophia Wright-Turflinger won the all-around title with a 37.65. Carroll, Hoffmann and Steinke swept the top three podium spots in vault, while Carroll and Steinke finished first and second, respectively, on the beam. 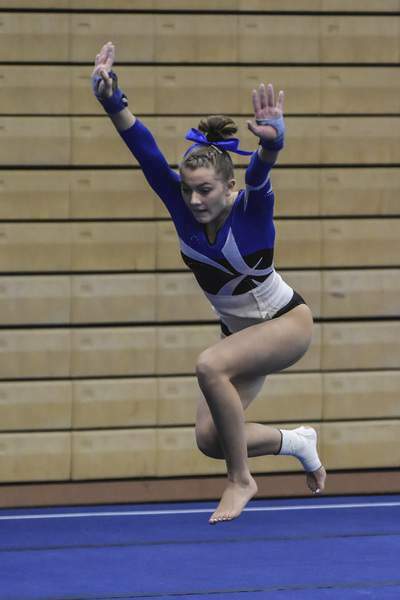 Homestead’s Catherine Milne turned in two individual titles, winning the uneven bars and the floor exercise. While each Spartan gymnast fell at least once during their beam routines, coach Jodi Hardwick was proud of how her team rallied to turn in stronger performances in their final two events to finish third. Other individuals advancing to regionals out of the Concordia sectional include Regan Twomey of the host Cadets, who finished third on bars, and Huntington North’s Danielle Korporal, who took sixth on floor. WAWASEE: In Syracuse, the host Warriors led area teams, scoring 104.525 points to place second. DeKalb edged out East Noble for third, 103.95-101.2, with the Barons earning the regional berth. Wawasee’s Reagan Atwood (beam) and DeKalb’s Shiloh Miller (floor) both won individual events. Atwood took third in the all-around, while Miller was fourth. Angola’s Emily Bracey qualified for regionals in two events, placing fourth in floor and third in vault. East Noble will take two in floor to regionals, as Ciara Honeycutt took fifth and Miah Hudson was sixth in the event. Warsaw’s top finisher on the day was Remi Beckham, who was fifth on beam.